Aminy and Edward proudly accept the award at the induction ceremony in High Point, N.C.
from sumptuous silk and luxurious linens to updated damask and rich velvets, the possibilities are limitless. Along with the rich background of this exciting change is a commitment to remaining constant in: • Manufacturing in the USA • Preserving and improving the superb quality that is Stickley’s trademark • The creation of enduring value • Being a socially responsible corporate citizen • Caring for our environment • Attracting the most talented and diverse team and investing in their well-being by providing a nurturing and safe work environment. Our year round wellness program, has impacted the quality of life of our employees, from smoking cessation and the Biggest Loser weight loss program, to walk at work and annual base line health testing. Individuals are delighting in taking personal responsibility for their well-being while enjoying the fun and camaraderie with their colleagues. We hope you enjoy browsing through this catalog and the very versatile Selectional® offerings. From timeless traditional to the marvelously modern, you are likely to find something that helps transform your home into a sanctuary of grace and beauty. We look forward to hearing your own Stickley story and we thank you for considering Stickley a part of your family tradition. Stickley For Every Style Whatever your style, youâ&#x20AC;&#x2122;ll feel at home with Stickley. From tailored silhouettes in the Modern Collection, to the perfect-in-any-room Casual Classics Collection, to the traditional elegance of the Classics Collection, youâ&#x20AC;&#x2122;ll find the perfect complement to your unique lifestyle. "Yes, we can." We take pride in being able to customize our products to meet your dreams. Over 1400 fabrics and leathers, dozens of decorative fringes and cords, 26 finishes, 8 skirt styles, 3 different cushion choices, and a selection of base options provide more than enough choices to create a custom product that is uniquely yours. 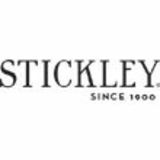 Stickley offers you additional upholstery options with the versatile Selectionals program. Whether you prefer the elegant refinement of a traditional sofa or the low, sleek lines of a modern sectional, with Selectionals you can custom design your piece to make it your very own. For more details, please refer to our Selectionals catalog! The Stickley Difference Since 1900, Stickley has been recognized for unique and highly sophisticated construction techniques in solid wood furniture. As the logical extension of this cherished tradition, Stickley Fine Upholstery applies this same attention to detail to fine upholstery. Like the blind dovetail joints in many Stickley dressers, most of the construction features noted on the following pages are hidden beneath the surface, and are indicative of the deep sense of pride and workmanship in Stickley products. Marshall Unit Backs provide lifetime support. Fully mitered and fully lined skirts provide uncommon tailoring details. Adjustable glides for skirted pieces. High-carbon steel springs are 8-way handknotted for engineered comfort. Double doweled 5/4 kiln dried maple frames for exceptional durability. The Stickley shopmark is proudly fixed to each piece. The intricate picture frame seam at each corner of a Stickley fully mitered skirt eliminates extra layers of fabric and allows it to drape freely. Stickley skirts are fully lined so that you will never see staples or ragged edges beneath a Stickley skirt. Even these hidden areas are to be as clean and neatly tailored as the surfaces you look at every day. Center Matching is used for fabrics with a dominant center motif where the placement of a fabric’s motif is in the center of each seat and back cushion. All multiple piece sectionals are center matched. The artisans at Stickley Fine Upholstery still secure each spring with 8 separate hand-tied knots (rather than simple loops) of high quality tying twine. This old-world process takes twice as long, but the results will last a lifetime. Flow Matching allows the pattern to “flow”, both horizontally and vertically through fabric placement across the surface of the piece. Flow matching requires the highest degree of skill and patience. Most Stickley frames are made from 5/4 kiln dried maple with joints that are double doweled for maximum durability. For over 100 years the Stickley shopmark has signified a commitment to the highest levels of craftsmanship. It can be found on every piece of Stickley Fine Upholstery. Skirted pieces are fitted with adjustable glides that allow the skirt height to be adapted to varying carpet thicknesses, as well as to hardwood floors. Modern Sofas Sleek silhouettes of tailored upholstery combine with meticulous details and minimalist styling for an absolutely on-trend look. Newbury Sofa 96-9044-86 CL-8044-86 Outside W86 D35½ H32¼ Inside W76¼ D21¾ Arm H32¼ Seat H21 Cherry frame. Metro Sofa 96-9197-85 96-9197-85 Outside W85 D33 H35 Inside W73 D20½ Arm H36½ Seat H21 Cherry legs. Cascade Sofa 96-9037-91 CL-8037-91 Outside W91 D37½ H33¼ Inside W67 D22 Arm H28 Seat H19 Maple legs. Carson Sofa 96-9188-102 CL-8188-102 Outside W102 D44 H31 Inside W78 D23¾ Arm H27 Seat H19 Maple legs. For alternative leather version with decorative stitching, see the Cohiba Sofa, p. 121. Essex Tightback Sofa 96-9109-84-TB CL-8109-84-TB Outside W84 D37½ H36 Inside W66 D22½ Arm H25½ Seat H21 Maple legs. Also available: 96-9109-92-TB Essex Tightback Sofa 96-9109-84-2-TB Essex Two Cushion Tightback Sofa 96-9109-73-TB Essex Tightback Loveseat 96-9109-CH-TB Essex Tightback Chair p. 47 96-9109-OT Essex Ottoman p. 170 Also see Essex loose pillowback series, p. 65. Murray Hill Sofa 96-9134-78 96-9134-78 Outside W78½ D35 H35½ Inside W68½ D21 Arm H28 Seat H20 Floating base. Also available: 96-9134-84 Murray Hill Sofa 96-9134-71 Murray Hill Sofa 96-9544-79-Q Murray Hill Sleep Sofa p. 111 96-9544-71-F Murray Hill Sleep Sofa 96-9641 Murray Hill Sectional p. 104 Roll arm option available (add -1K to model number). Modern Chairs Striking silhouettes form these on-trend accent chairs, crafted of neatly tailored high quality upholstery for a contemporary lifestyle. Park City Wing Chair 96-9062-CH CL-8062-CH Maple legs. Nail head trim standard. Fairport Wing Chair 96-9750-CH CL-8750-CH Maple legs. Nail head trim standard. Cherry legs. Nail head trim standard. Tribeca Lounge Chair 96-9003-CH Cherry base. Ritz Chair 96-9740-CH CL-8740-CH Maple legs. Nail head trim standard. Port Royal Chair 96-9048-CH CL-8048-CH Cherry legs. Princeton Chair 96-9748-CH Cherry frame. Hamilton Chair 96-9746-CH CL-8746-CH Cherry legs. Charleston Chair 96-9031-CH CL-8031-CH Cherry legs. Leleu Chaise (Right Facing) JW-650-R Cherry frame. Radius Chair 96-9731-CH 96-9731-CH Cherry legs. Outside W30 D29½ H32½ Inside W19 D21½ Arm H26 Seat H20 Specialty finish shown: Blackberry For more specialty finish options, see p. 178. Oak Park Chair 96-9391-CH 96-9391-CH Cherry legs. 96-9393-CH 96-9393-CH Cherry legs. For a leather version with decorative seams see the Telluride Chair, p. 131. Pacific Heights Chair 96-9033-CH CL-8033-CH Cherry legs. Midtown Wing Chair 96-9796-CH CL-8796-CH Maple legs. Nail head trim standard. 96-9255-CH European Beech frame. Available in Ebony, Burnished Ebony only. Relaxed, comfort wrinkles on the curved back cushion are part of the design of the Sonoma Chair. Melrose Chair Outside W27 D30½ H38½ Inside W21½ D20 Arm H26 Seat H19¾ Specialty finish shown: Burnished Ebony For more specialty finish options, see p. 178. Chino Chair 96-9059-CH CL-8059-CH Maple legs. Nail head trim standard. Irving Place Arm Chair 96-9002-CH 96-9002-CH Cherry legs. Odessa Button Back Chair 96-9254-CH CL-8254-CH Maple legs. Bayport Wing Chair 96-9880-CH CL-8880-CH Maple legs. For alternate leather version with decorative stitching, see Cohiba Chair, p. 131. Casual Classics Sofas The fabric sofas of Stickleyâ&#x20AC;&#x2122;s Casual Classics Collection feature versatile designs crafted with Stickleyâ&#x20AC;&#x2122;s famous 8-way hand-knotted construction that easily mix and match into a casual room. For fabric or leather version with nail head trim, see Medford series on p. 139. Bay Road Sofa 96-9790-78 96-9790-78 Outside W78 D35¼ H32¼ Inside W71 D20½ Arm H24 Seat H20 Oak legs. Nail head trim standard. Also available: 96-9870-CH Bay Road Chair p. 71 96-9870-OT Bay Road Ottoman p. 169 For an alternative leather version with decorative seams, see the Alameda Blvd. Sofa, p. 135. Chicago Sofa 96-9088-101 CL-8088-101 Outside W101 D46¼ H27 Inside W78 D29½ Arm H27 Seat H19 Maple legs. Also available: 96-9088-COT Chicago Cocktail Ottoman p. 170 96-9088-COT-ST Chicago Storage Ottoman p. 170 Sofa also available with two cushions. Essex Sofa 96-9109-92 CL-8109-92 Outside W92 D37½ H36 Inside W74 D21 Arm H25½ Seat H21 Maple legs. Also available: 96-9109-84 Essex Sofa 96-9109-84-2 Essex Two Cushion Sofa 96-9109-73 Essex Loveseat 96-9109-CH Essex Chair p. 73 96-9109-OT Essex Ottoman p. 170 Also see Essex Tightback series, p. 27. Casual Classics Chairs An easily adaptable style allows the fabric chairs of the Casual Classics Collection to blend perfectly with the relaxed lifestyle of the Arts & Crafts collections by Stickley. Georgetown Chair 96-9025-CH CL-8025-CH Maple legs. Maple legs. Nail head trim standard. For fabric or leather version without nail head trim, see Natick series on p. 77. Pasadena Chair 96-9041-CH 96-9041-CH Sapelli wood base. The Leopold’s chair is an L. & J.G. Stickley classic from the 1930s and has been our most popular chair since it was reissued in 1996. The arm of this exceptional chair was said to be one of Leopold Stickley’s favorite design elements. The universally comfortable Leopold’s Chair requires over one half of a day of careful hand tufting by our most skilled artisans. Leopold's Chair 96-9328-CH 96-9328-CH Cherry legs and arms. Nail head trim standard. Sedona Chair 96-9399-CH 96-9399-CH Maple legs. For alternate leather version see Melbourne Chair, p. 133. Sausalito Arm Chair 96-9354-CH 96-9354-CH Maple legs. Tempe Chair 96-9708-CH CL-8708-CH Maple legs. For fabric or leather version without nail head trim, see the Arlington series, p. 153. Versailles Chair 96-9024-CH CL-8024-CH Maple legs. Nail head trim standard. Natick Chair 96-9877-CH CL-8877-CH Maple legs. Classics Sofas Timeless designs, executed exceptional attention to detail for unsurpassed comfort. Enhance your home with a variety of upholstery styles from our Classics Collection. Wayzata Sofa 96-9853-96 Outside W96 D43 H38¼ Inside W82 D21½ Arm H24¾ Seat H20½ Nail head trim standard. Edina Sofa 96-9856-96 96-9856-96 Outside W96 D43 H38¼ Inside W82 D21½ Arm H24¾ Seat H20½ Maple legs. Nail head trim standard. Eastman Settee 96-9156-66 96-9156-66 Outside W66 D34½ H37 Inside W47 D21 Arm H27½ Seat H21½ Cherry legs. Classics Fabric Chairs Eternally in style, you canâ&#x20AC;&#x2122;t go wrong with these timeless and traditional styles from the Stickley Classics Collection. Fitting in with any dĂŠcor without sacrificing comfort or style, these chairs have it all. Iribe Salon Chair JW-2771-CH Solid cherry frame. Wilshire Chair 96-8382-CH European beech frame. Outside W24 D23 H37 Inside W19½ D19 Arm H27½ Seat H20½ Specialty finish shown: Ebony For more specialty finish options, see p. 178. Monroe Place Chair European beech frame. Specialty finish shown: Burnished Ebony For more specialty finish options, see p. 178. 96-9177-CH Mahogany legs and arms. Brooklyn Heights Wing Chair 96-9370-CH 96-9370-CH Mahogany legs. Sherburne Wing Chair 96-9374-CH 96-9374-CH Mahogany legs and stretchers. European beech frame. Specialty finish shown: Aged Honeycomb For more specialty finish options, see p. 178. Specialty finish shown: Spa For more specialty finish options, see p. 178. Sectionals Create your own customizable modern forms for a flawless look and supreme comfort. 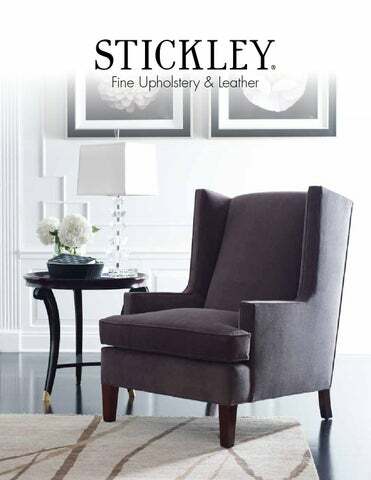 For additional Stickley sectionals, see the Stickley Selectionals速 catalog. The clean transitional lines of the Murray Hill make it our most versatile and space efficient sectional. It is also the only Stickley Sectional that offers a sleep sofa component. The Murray Hill sectional is shown above with three optional pillows. Roll arm option available (add -1K to model number). For additional Stickley sectionals, see the Stickley Selectionals® catalog. Overall lengths will vary with arm selection. Roll arm option available (add -1K to model number). Sleep Sofas Beauty and functionality combine in Stickley’s Sleep Sofas, cleverly crafted for the utmost comfort, no matter the use. Also see the Selectionals® 100 Series custom sleep sofas. All Stickley sleep sofas feature the finest quality sleeper mechanism which includes a locking TV headrest and a 5-inch thick premium quality innerspring mattress. For additional Stickley sleep sofas, see the Selectionals® 100 Series custom sleep sofa program. The Orchard Street and Fayetteville sleep sofas are available with an optional 76" long innerspring mattress, memory foam mattress or an Air Dream® mattress. Optional Air Dream® mattress inflates in seconds, providing the same dimensions and luxury feel of a premium mattress. Malden Sleep Sofa 96-9875-87-Q CL-8875-87-Q Outside W87 D39 H36½ Inside W69 D21½ Arm H26¾ Seat H19½ Maple legs. Nail head trim standard. Memory foam mattress. For fabric or leather version without nail head trim, see Arlington sleep sofa, p. 111. Arlington Sleep Sofa 96-9874-87-Q CL-8874-87-Q Outside W87 D39 H36½ Inside W69 D21½ Arm H26¾ Seat H19½ Maple legs. Memory foam mattress. For fabric or leather version with nail head trim, see Malden sleep sofa, p. 109. Lake Way Sleep Sofa 96-9876-82-Q CL-8876-82-Q Outside W82 D38 H36¼ Inside W71 D21½ Arm H26 Seat H20 Maple legs. Memory foam mattress. Murray Hill Sleep Sofa 96-9544-79-Q 96-9544-79-Q Outside W79 D35 H35½ Inside W69 D21 Arm H28 Seat H20 Also available: 96-9544-71-F Murray Hill Full Sleep Sofa Roll arm option available (add -1K to model number). Cohiba Swivel Chair CL-8196-CH-SW For fabric or leather application without decorative seams, see French Roast Swivel Chair. French Roast Swivel Chair 96-9396-CH-SW 96-9396-CH-SW For alternative leather version with decorative stitching, see Cohiba Swivel Chair. Chandler Ease Back Power Chair 96-9728-EB-P CL-8728-EB-P Rechargeable battery available. See next page. Maple legs. Rechargeable Also available: battery available. CL-8014-REC-P Grisham Power Recliner See next page. Durango Recliner 96-9080-REC-M CL-8080-REC-M Maple legs. Nail head trim standard. Rechargeable battery available. See next page. Salinger Recliner 96-9015-REC-M CL-8015-REC-M Maple legs. Nail head trim standard. Rechargeable battery available. See next page. High Back Executive Chair CL-8802-ST Adjustable height. Cherry frame. Low Back Executive Chair CL-8803-ST Adjustable height. Cherry frame. Stickley Power Recliners are available with an optional rechargeable battery, that powers your recliner for over 200 complete cycles between charges. Stickley Leather Collection Styled for every taste, perfect for every setting; the Stickley Leather Collection combines the world's finest and most unique leathers with the careful tailoring, old-world construction, and legendary comfort that make Stickley the most highly respected name in fine upholstery. Modern Leather Sofas On-trend sofas in a range of sumptuous hand-tailored leathers that fit your lifestyle. From the durability of everyday leather to the butter-soft feel of pure aniline, our modern sofas are styled for the way you live. For fabric or leather application without decorative seams, see French Roast Series, p. 25. Modern Leather Chairs Make a statement with bold silhouettes that fit within any modern or transitional interior, adding instant sophistication and taste to any room. Flatiron Chair 96-9052-CH CL-8052-CH Cherry legs. Biscayne Chair 96-9720-CH 96-9720-CH European beech arms and legs. Berkeley Chair 96-9732-CH 96-9732-CH Cherry base. Specialty finish shown: Burnished Ebony For more specialty finish options, see p. 178. 96-9740-CH CL-8740-CH Maple legs. Nail head trim standard. Maple legs. For fabric or leather version without decorative seams, see French Roast series, p. 49. For fabric or leather version without decorative seams, see Chelsea series, p. 41. Eldorado Chair 96-9030-CH CL-8030-CH Maple legs. For alternate fabric version see Oberlin Chair, p. 69. Casual Classics Leather Sofas The relaxed Arts & Crafts lifestyle, leather sofas provide unparalleled comfort, design, and versatility. Orchard Street Sofa 89/91-9236-82 89/91-9236-82 Outside W82 D37 H34 Inside W71 D20½ Arm H25 Seat H21 Available in Quartersawn White Oak (89-) or Cherry (91-). Also available: 89/91-9236-65 Orchard Street Loveseat 89/91-9236-82-Q Orchard Street Queen Sleep Sofa p. 109 89/91-9236-74-F Orchard Street Full Sleep Sofa 89/91-9236-61-T Orchard Street Twin Sleep Sofa See back view represented above. For an alternate leather version without decorative seams, see the Bay Road Sofa, p 55. For fabric or leather version without nail head trim, see the Arlington series on p. 147. For fabric or leather version without nail head trim, see the Natick series on p. 51. Cheyenne Sofa CL-8045-86 Outside W86 D38½ H37 Inside W64½ D20½ Arm H25 Seat H20½ Maple legs. The Cheyenne series is similar in appearance to the Santa Fe, but is a scaled down version for smaller spaces. For fabric or leather version with nail head trim, see the Malden series on p. 137. Casual Classics Leather Chairs Searching for the perfect leather chair? These leather creations from Stickley achieve comfort, style and durability in styles that mix perfectly with casual furniture. Newcastle Chair 96-9043-CH CL-8043-CH Maple legs. Nail head trim standard. Maple legs. Nail head trim standard. For fabric or leather version with nail head trim, see Malden series on p. 165. Ocean Blvd Lounge Chair 96-9780-CH CL-8780-CH Knotty oak frame. Tahoe Chair 96-9028-CH CL-8028-CH Maple legs. Nail head trim standard. Maple legs. Nail belting standard. Greenville Chair 96-9737-CH CL-8737-CH Maple legs. For fabric or leather version with nail head trim, see Medford series, p. 163. Paris Club Chair 96-9026-CH CL-8026-CH Maple legs. Alameda Blvd Chair CL-8782-CH Oak legs. Nail head trim standard. For alternate version without decorative seams see the Bay Road Chair, p. 71. Lake Placid Chair CL-8735-1-CH Maple legs. Only available with ½" Antique Gold Nails. Only available in handfinished "Vintage Saddle" leather (as shown). Also available in any other fabric or leather as the Saranac Chair (96-9735-CH/CL-8735-CH). For fabric or leather version without nail head trim, see Natick series, p. 77. Lincolnshire Chair CL-8001-CH Maple legs. Maple legs. Nail head trim standard. For fabric or leather version without nail head trim, see the Arlington series on p. 153. Maple legs. Nail trim standard. Cherry legs and arms. Semi-attached back standard. Nail head trim standard. Classics Leather Chairs The leather chair: a staple for every home. Crafted of luxurious leather and with intricate details like nail head trim and tufted seat backsthese chairs an essential and classic edition to the home. Huron Chair 96-9032-CH CL-8032-CH Cherry legs. Nail head trim standard. Salinger Chair 96-9015-CH CL-8015-CH Maple legs. Pinehurst Wing Chair 96-9706-CH CL-8706-CH Maple legs. Nail head trim standard. W48 D25 H17 Cherry legs. Nail trim standard on turned legs (-TN) only. W48 D25 H17 Cherry legs. Also available with turned legs (-TN). Also available with tapered legs (-TP). W42 D42 H17 Cherry legs. Nail trim standard on turned legs (-TN) only. Diameter 36 H17 Maple legs. Only available with block legs (as shown). W36 D36 H17 Cherry legs. Nail trim standard on turned legs (-TN) only. Also available with tapered legs (-TP). W36 D25 H17 Cherry legs. Also available with turned legs (-TN). W24 D19¼ H17½ Oak legs. W22 D19 H14½ Maple legs. Nail head trim standard. W26 D18 H18 Cherry legs. W48 D24 H18 Cherry legs. W25 D22 H18¼ Maple legs. Bay Road Ottoman 96-9790-OT W24 D19¼ H17½ 96-9790-OT Oak legs. Nail head trim standard. W22 D19 H19 Maple legs. Blowing Rock Ottoman 96-9046-OT W24½ D21½ H16¼ CL-8046-OT Maple legs. Nail head trim standard. W26 D23 H18½ Maple legs. W24½ D18½ H17 Beech legs. Booth Bay Ottoman 96-9850-OT W29¼ D23¼ H19½ 96-9850-OT Maple legs. W22½ D19 H17 Maple legs. W27½ D19 H19 Maple legs. Nail head trim standard. W22½ D19 H19 Maple legs. W29½ D20 H19 Maple legs. Stickley ® provides a perfect ottoman for almost every chair. These beautiful and practical accents are designed to enhance the seating quality of our chairs and make them "the best seat in the house." W26½ D23 H19½ Cherry legs. Bradford Cocktail Ottoman CL-8284-COT W65½ D26½ H18½ Maple legs. W26¾ D20¾ H20 Cherry legs. W29 D23 H18½ Cherry legs. W31 D22 H19 Maple legs. W23 D23 H14 Maple legs. Nail head trim standard. W23 D18½ H19½ Maple legs. W23½ D23½ H16 Maple legs. W31 D24 H20 Maple legs. W21 D21 H19 Maple legs. W26 D20 H17¾ Maple legs. W24 D20 H18 Cherry base. Nail head trim standard. W26 D22 H18½ Skirt standard. Chicago Cocktail Ottoman 96-9088-COT W61½ D29½ H15¼ CL-8088-COT Maple legs. W26¼ D22¼ H18 Maple legs. W25 D20 H20 Cherry legs. W33 D25 H18 Maple legs. W48 D23½ H16¼ Cherry legs. Chicago Storage Ottoman 96-9088-COT-ST W61½ D29½ H15¼ CL-8088-COT-ST Maple legs. W28 D22½ H19½ Maple legs. W25 D22½ H19½ Maple legs. W27¾ D22 H18¾ Cherry legs. Nail head trim standard. W25 D17 H18½ Maple legs. Nail head trim standard. Lake Placid Ottoman* CL-8735-1-OT W22½ D19 H17 Maple legs. W25 D22 H18¼ Maple legs. Nail head trim standard. W27 D22 H18 Maple legs. Nail head trim standard. W29½ D20 H19 Maple legs. Casters. W21 D18 H16 Cherry legs. W29 D23 H21 Cherry legs. W25 D20 H17½ Maple legs. London Ottoman W18 D18 H16 Casters. W29 D21 H16½ Oak legs. W27 D20½ H16 Maple legs. *The Lake Placid Ottoman is available in "Vintage Saddle" leather (as shown above). Available in any other fabric or leather as the Saranac Ottoman (96-9735-OT/CL-8735-OT). W26 D22 H18½ Maple legs. Nail head trim standard. Irving Place Ottoman 96-9002-OT W24½ D18½ H20½ 96-9002-OT Cherry legs. W35 D23½ H19½ Maple legs. Nail head trim standard. W26 D19½ H15½ Cherry legs. Nail head trim standard. London Cocktail Ottoman 96-9758-COT W58 D26 H16 CL-8758-COT Maple legs. Michigan Ave Ottoman 96-9027-OT W23½ D23½ H18½ CL-8027-OT Cherry legs. Monterey Storage Ottoman CL-8096-COT-ST W65½ D26½ Nail belting standard. H18½ Maple legs. W24½ D18½ H20½ Cherry legs. Pacific Heights Ottoman 96-9033-OT W25 D21¼ H18½ CL-8033-OT Cherry legs. W24 D20 H18 Oak base. Midtown Ottoman 96-9796-OT W24 D22 H17¼ CL-8796-OT Maple legs. W26 D22 H18½ Maple legs. W27 D22 H19 Maple legs. Paris Ottoman 96-9026-OT W27 D23 H19 CL-8026-OT Maple legs. Monterey Ottoman CL-8096-OT W22½ D19 H19 Maple legs. Nail belting standard. Ocean Blvd Ottoman 96-9780-OT W23 D17¼ H17½ CL-8780-OT Oak legs. Park City Ottoman 96-9062-OT W30 D23 H19½ CL-8062-OT Maple legs. Monterey Cocktail Ottoman CL-8096-COT W65½ D26½ H18½ Maple legs. Nail belting standard. Newcastle Ottoman 96-9043-OT W23¾ D20 H16¼ CL-8043-OT Maple legs. Nail head trim standard. W23½ D20½ H17¼ Maple legs. Parkridge Ottoman (Cherry) 96-9082-OT-CHERRY W24 D20 H18 CL-8082-OT-CHERRY Cherry base. W31 D23 H19 Maple legs. Pinehurst Ottoman 96-9706-OT W29 D22 H19½ CL-8706-OT Maple legs. Nail head trim standard. San Jose Ottoman 96-9047-OT W27¼ D22¼ H17¾ CL-8047-OT Maple legs. Somerville Ottoman 96-9873-OT W26½ D22½ H18¼ CL-8873-OT Maple legs. W26 D23¼ H18 Maple legs. W27 D21¼ H16½ Cherry legs. W34 D22 H17 Maple legs. Sugarbush Ottoman 96-9079-OT W25¾ D22½ H18 CL-8079-OT Maple legs. Salinger Ottoman W22 D19 H19½ Maple legs. Nail head trim standard. W38 D25 H18 Maple legs. Sundance Ottoman 96-9743-OT W24½ D16½ H18½ CL-8743-OT Maple legs. Nail head trim standard. Tempe Ottoman 96-9708-OT W23½ D20 H20½ CL-8708-OT Maple legs. W34½ D24½ H17½ Maple legs. W65½ D26½ H18½ Maple legs. W23½ D26¼ H18½ Maple legs. Tribeca Ottoman 96-9003-OT W27 D20 H19 Cherry base. Versailles Ottoman 96-9024-OT W28½ D23 H17½ CL-8024-OT Maple legs. Nail head trim standard. W25 D19 H16 Beech frame. W25 D19 H16½ Cherry legs. Nail head trim standard. Decorative Pillows Choose from 8 different size options, 9 different tailoring options, and over 1400 fabrics, leathers, and trims to create the perfect, custom pillows for your home’s unique decor. Its as easy as 1, 2, 3! *Only available with tailoring options -100 and -101. **Button not available. Center Buttons – Add 1½" Button to the center of your pillow. Just add “-BTN” to the tailoring options shown on the opposite page, and specify the fabric of you button. Leather Guide Whether your taste in leather ranges from kid-friendly, everyday durability, to the natural, buttery softness of a luxurious “Pure Aniline” leather, or the rustic, scarred appearance of an old bomber jacket, you’ll find the design statement that’s perfect for you and your lifestyle in the Stickley Leather Collection. The leather guide on these pages is designed to help you make the right selection. When working with your designer, you will notice that the Stickley leather samples are grouped together into the following categories. Nubuck Leathers: Unique, Exotic and Fragile Choose a Nubuck leather if... • You appreciate the exotic, suede-like softness that only a Nubuck leather can provide. • You understand that Nubuck leathers offer little or no protection from stains, will quickly absorb spills and body oils, and will darken in high use areas. • You understand that Nubuck leathers will fade quickly in direct sunlight. What to expect The characteristic suede-like feel of a Nubuck leather is achieved by buffing the hide to create a heavy, raised nap. Nubuck leathers have a unique softness, but have very little protection against stains and fading. Although buffing will reduce scars and imperfections, you can still expect to see: • Shade variations as different areas of the hide accept the dye differently, and as the nap of the leather is disturbed • Wrinkles • Healed scars and stretch marks • Insect bites • Texture variations from smooth to pebbled Care and Maintenance Do not use any cleaner or protection product that is not specifically designed for Nubuck leather. To remove loose soil and restore the nap, we suggest a special Nubuck cloth wrapped around a sponge. For stain removal and cleaning, contact a professional furniture cleaning service. See your designer for further information. Our most consistent, durable, “family-friendly” leathers. Rustic, abused, and full of character. Choose an everyday leather if... • You need a “family–friendly“ leather that will offer the best defense against kids, pets, spills, and sunlight. Please see the ratings on the back of the swatch for the relative performance of each leather. • You expect the color of your leather to be uniform and consistent. Choose an “oiled pull up” leather if... • You love the rough, heavily scarred, worn look of a true specialty leather. • Color consistency is not important to you. • You understand that scratch marks will appear with use, adding to the rustic charm of the piece. • You appreciate the natural appeal of scars, wrinkles, and imperfections. • You understand that this leather has little protection against spills and abrasive wear. What to expect Everyday leathers are durable and easy to maintain. They are classified as semi-aniline leathers, and are finished using both aniline dyes and solid-color pigments. Semi-aniline leathers are more color-consistent, more stain resistant, and more fade resistant than other leather types. Although colored pigments will help hide imperfections, your leather will have visible: Grain/Texture Variations • Wrinkles • Healed scars and insect bites • Texture variations from smooth to pebbled Care and Maintenance Like any fine leather product, leather furniture should be cleaned and protected every 6 months (every 4 months for lighter colors). See your designer for further information. What to expect An oiled pull up leather will “burst” or lighten dramatically when stretched over firm areas, highlighting the natural scars and imperfections. Likewise, fingernail scratches will leave marks, adding to the distressed look. Regular maintenance is required to prevent fading. You will see: • Pronounced color variations and gradual lightening as the oils dissipate • Healed scars, stretch marks and insect bites • Texture variations from smooth to pebbled • Surface scratches will appear with use Care and Maintenance Oil pull-up leathers require more maintenance than other leathers, and will fade and dry out without regular care. They should be cleaned and protected every 4-6 months. See your designer for further information. Rustic and full of character. …Like an old bomber jacket. Choose a hand antiqued leather if... •Y  ou love the rustic look of aged, worn, distressed leather. • Color consistency is not important to you. •Y  ou appreciate the natural appeal of scars, fat wrinkles, and imperfections. •Y  ou need a leather that provides moderate protection against spills and abrasive wear. Choose a waxed pull up leather if... • You love the worn, distressed look of a very rustic, old leather. • Color consistency is not important to you. • You appreciate the natural appeal of scars, wrinkles, surface scratches, and imperfections. • You want a leather that gives moderate protection against spills and abrasive wear. Care and Maintenance Like any fine leather product, leather furniture should be cleaned and protected every 6 months (every 4 months for lighter colors). See your designer for further information. Nature’s finest. And little else. Choose a pure aniline leather if... •Y  ou appreciate the simple beauty of a natural hide. •Y  ou want the warm, butter-soft feel that only pure aniline leathers provide. •Y  ou understand that leathers are more fragile and offer little protection from stains. •Y  ou understand that these leathers will fade quickly in direct sunlight. Choose a tooled embossed leather if... • You are looking for the perfect specialty leather for use as an accent on your leather furniture. • You understand that the use of these leathers is limited. They are not available for use as the primary leather on a sofa or chair. • You understand that scratch marks will appear with use, adding to the rustic charm of the piece. • You want a leather that gives moderate protection against spills and abrasive wear. What to expect Pure Aniline leathers are as close to the natural leather as they can be. Because they are colored with only clear Aniline dyes, they are the softest, most elegant leathers available, but offer very little protection against stains, body oils, and fading. Additionally, scars, natural markings and imperfections will be highly visible and add to the natural charm of the hide. You can expect to see: • Shade variations as different areas of the hide accept the dye differently • Wrinkles and stretch marks • Healed scars and insect bites • Texture variations from smooth to pebbled Care and Maintenance Like any fine leather product, your leather furniture should be cleaned and protected every 6 months (every 4 months for lighter colors). See your designer for further information. What to expect Tooled embossed leathers are all designated as “red dot” leathers in the Stickley line, meaning that their use is restricted to small or accent areas only. These leathers are created using small or half hides which are stamped with heavy steel embossing dies under pressure. In this process, there will be inevitable overlapping and misalignment of the embossing pattern. This characteristic limits the use of tooled embossed leathers to small designer accents only. Fingernail scratches and wrinkle lines will be prevalent on some embossed leather, such as the Serrano series, adding to the distressed look. Care and Maintenance Like any fine leather product, your leather furniture should be cleaned and protected every 6 months (every 4 months for lighter colors). See your designer for further information. Printed images cannot convey the depth, clarity, and beauty of our hand-rubbed finishes. This page is intended only to show the wide variety of finishes that we offer. Please use it as a general reference, but not as the basis for selecting your finish. We encourage you to visit an authorized Stickley dealer near you to experience the beauty of our finishes first hand. Wood and Specialty Finishes The wood finishes shown below are designed for use only on the exposed maple or European Beech that is standard on many Stickley Fine Upholstery styles. Frames which feature exposed cherry, mahogany, or white oak are noted, and are available in a selection of the fine finishes shown in the Stickley Modern, Classics and Mission catalogs. The finishes shown below provide exciting accents of color and texture to any frame style in the Stickley Fine Upholstery collection. We believe strongly in the quality and integrity of our workmanship. Should a manufacturing defect occur with one of our products, it will be repaired or replaced at our option. This warranty does not apply to damage during transit, or to any defects resulting from abuse, alterations, or accidents. This warranty does not apply to fabrics or leathers supplied either by Stickley or by the customer. Direct exposure to the ultraviolet rays of the sun will hasten the natural fading of all fabric and leather dyes. The clear dyes of Aniline leathers are particularly susceptible to sun fading. Vacuum your cushions regularly In order to remove dust and accumulated soil. Microscopic dirt particles have an abrasive quality that is the biggest factor in fabric wear. Rotate your cushions periodically We all tend to slouch a bit when settling into our favorite piece of upholstery. This subtle slouching motion will gradually drag the cushion fabric toward the front of the piece. Rotating the cushions keeps the casing positioned properly on the cushion core, and also evens out the impact of frictional wear and sun exposure on the fabric. Be careful with pets around your furniture The simple snagging of a pet’s claw can disfigure an upholstery fabric and lead to its premature wear. We believe strongly in the quality and integrity of our workmanship. Should a manufacturing defect occur with one of our products, it will be repaired or replaced at our option. This warranty does not apply to damage during transit, or to any defects resulting from abuse, alterations, or accidents. This warranty does not apply to fabrics or leathers supplied either by Stickley or by the customer. As you would expect, we take our role as caretakers of the Stickley name very seriously. We don’t talk much about doing the right thing, we just do it. Use adjustable glides if necessary Proper adjustment of the leg glides will prevent a skirt from “puddling” on a deep pile carpet and becoming permanently distorted. Fabric Cleaning All Stickley fabrics are protected with Dupont Teflon® or a similar stain repellent. Should cleaning be necessary, a small label is attached to each piece of Stickley Fine Upholstery that gives specific information on the care and cleaning of the fabric that you have selected. (This information is also available from your dealer to assist you with your fabric selection). These instructions should be followed carefully. At Stickley, we subscribe to the most basic conservation philosophy known; Quite simply, our furniture is built to last. Cheaper, impulse products seem less expensive at first, but you, and the environment pay the price for short lived, disposable home furnishings. The urethane foams used in Stickley Upholstery contain the maximum percentage of Soy-based Polyols, reducing the percentage of petroleum-based materials. The urethane foams used in our furniture are PDBE-free. Our hardwood frames are formaldehyde-free. The Stickley Sensuede collection provides the highest grade microfiber fabrics available, and is made from 100% recycled materials. We are dedicated to a philosophy of continuous improvement in our products, our processes, and our people. We will continually search for ways to refine and enhance the quality of your Stickley experience, in both the furniture that we make, and the way in which we make it. All Stickley Fine Upholstery is made to California Flammability Standards (TB-117); the toughest residential standards in the nation. Nail head Trim Options Several styles in the Stickley Leather Collection are standard with either 1" or ½" nail head trim, as indicated in the catalog and price list. On such pieces, you may select from one of the following nail head finishes. L. & J.G. STICKLEY, INC. P.O. Box 480, 1 Stickley Drive • Manlius, New York 13104-0480 • T 315.682.5500 F 315.682.6306 Stickley.com © 2014 L. & J.G. Stickley, Inc.